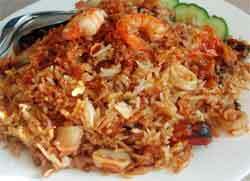 Nasi goreng is a favorite cusines found mainly in Indonesia, Singapore and Malaysia. It is simple to cook and does not requires a lot of ingredients. Nasi Goreng is local name for fried rice. Beat the eggs in a bowl until foamy. Add a little salt according to taste. Using a wok or frying pan, heat it up and coat it with a little cooking oil to avoid the food from sticking while cooking. Make an omelet by using a quater of the earlier mixed eggs. Ensure that both sides are evenly cooked. Repeat the process for another 3 times until all the egg mixtures have been used. Then cut the cooked eggs into strips for placing at the top of the nasi goreng later. Use a food processor to process the onion, chili, garlic, sugar and coriander until it became a thick paste. Heat up a wok or frying pan and add in 2 tablespoons of cooking oil. Then saute the processed paste and cooked until it is fragrant. Add the meat and raw shrimps. Cook for another few minutes until the color changes. Finally add in the cooked rice and add more cooking oil if necessary. Add all the sauces, scallions and continue frying for another 30~60 seconds, until it is fragrant. Scope from the work into a plate and add the strips of omelet at the top to garnish. Serve while hot.